In Chapter 12 we examined finite systems of particles distributed along a loaded string. A continuous string can be consider to be a limiting case of the loaded string, where we increase the number of masses n to infinity while decreasing the separation d between the masses to 0 such that (n+1)d = L = constant, and decrease the value of each mass m to 0 such that m/d = r = constant. Rework the problem in Example 13.1 in the event that the plucked point is a distance L/3 from one end. Comment on the nature of the allowed modes. The frequencies , , , etc. 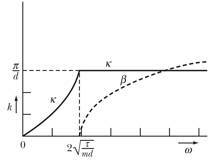 are absent because the initial displacement at prevents that point from being a node. Thus, none of the harmonics with a node at are excited. we can calculate the kinetic energy and the potential energy of the system. In the previous sections we have looked at the possible displacement patterns of a string, based on the solution of the loaded string discussed in Chapter 12. The solution discussed so far is appropriate for situations in which the restoring force is conservative, and no damping or driving forces are present. In order to determine the effect of external forces on the system, we need to go back and determine the force acting on each segment of the string. Figure 1. Small segment of a string. Our complicated second-order differential equation in x and t has been replaced by a simpler second-order differential equation in t.
When a particular driving force is applied to a string, it is observed that the string vibration is purely in the nth harmonic. Find the driving force. where g(t) is a function of t only. For n ¹ s, the integral is proportional to ; hence for s ¹ n.
Only the normal coordinate will be driven. The displacement we are focusing on thus appears to move with a velocity -v, and the quantity v is therefore called the wave velocity. We note that for this solution, the solution is traveling towards the left. We see that in general the velocities are wave-number dependent, unless w is proportional to k, and the medium is called a dispersive medium. When we look at this real part, we see that at certain values of x the amplitude is always 0. This solution can thus not represent a traveling wave. This particular solution is called a standing wave. The dependence of the components of k on w is shown in Figure 2. Figure 2. Dependence of the wave number (and its components) on the angular frequency. This solution has a position-dependent amplitude, indicating that the energy of the system is localized. However, the amplitude is not time dependent, and energy is thus conserved. 1. Transverse waves: particles are displaced in a direction perpendicular to the direction of propagation of the wave. 2. Longitudinal waves: particles are displaced in a direction parallel or anti-parallel to the direction of propagation of the wave.